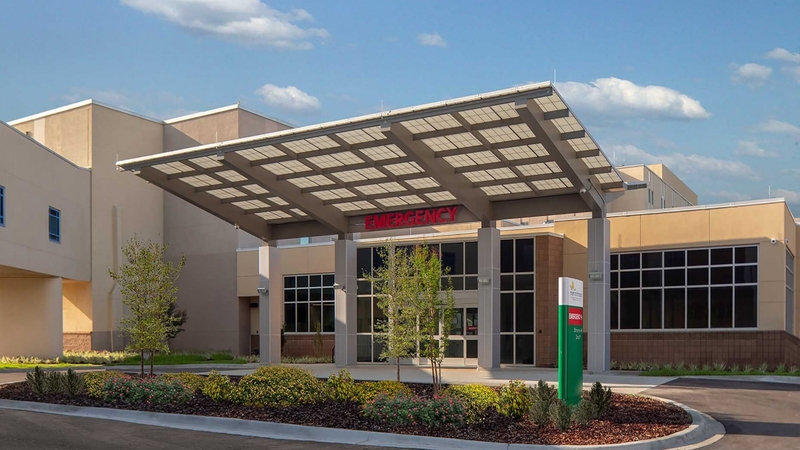 The expansion of the existing emergency department at Memorial Hospital Jacksonville enabled the existing separate pediatric unit to be combined within the emergency department. The separate pediatric building has long led to confusion for patients seeking the emergency room. The adult and pediatric departments share a single entrance and drop off, eliminating the entry confusion. Once inside the vestibule, adult and pediatric patients are separated into separate waiting rooms, triage, and exam rooms. Pediatric patients have a separated suite of seven exam rooms and a major room monitored by one nurse station. Low acuity patients are to be treated in the new conveyance bays. The bays and four added exam rooms circle around a central support space. The new stair and elevator towers lead up to the helipad placed on the roof. The renovation will add three dedicated behavioral health exam rooms, two trauma rooms, relocated exam rooms and a new CT dedicated to the emergency department.